Love the location and the staff, they're extremely helpful and welcoming. Will bring my family in the following years. The breakfast buffet provided a wide variety of foods that would appeal to many tastes (native and foreign). We looked forward to it every day. If you have kids, they won't ever be bored because there were so many activities to keep them occupied. The pools were great, very relaxing and it was great that there was more than one pool available for use. They were never crowded. Lots of things to do, like the shopping area and restaurants with good food. The staff was super friendly and mostly helpful, considering the language barrier. Last but not least, the resort itself was beautiful and offered amazing views of nature and very safe and secure. We would definitely stay here again. Gorgeous property. Beautiful pools and a very cheap and delicious 5 course meal at the on site little restaurant. The beach was a little hard to find at first but after the first walk it was easy to find again. The adjoining shopping mall has some construction noise, but the restaurants were good and not too expensive. The hotel was one of the kind. The only Chinese styled hotel in entire Sanya I think. Many couples came to the hotel to do a Chinese style photoshoot. The lagoon pool was beautiful. The hotel is in a heart of Yalong Bay and it is connected to a shopping centre full of restaurants and shops. Spa is great value and the massage was wonderful. The cleaners were absolutely lovely. Very helpful, polite, kind and courteous. Breakfast was decent enough. Close enough to the beach, though other resorts nearby are closer. The family room had the WOW factor, amazing view from balcony. Very comfy beds, spacious accommodation, huge round bath, plenty of storage. Breakfast was quality with a good choice. Excellent facilities at this resort, shops and many restaurants. That hotel had beach chairs at beach! However public was allowed to sit on hotel chairs without paying! Mainlanders can be very loud! Check in staff were good despite being stretched! Value for money hotpot, free flow beer at pool. Hotel is really good. Nice employees, outstanding breakfast and amazing buffet only for 155 RMB/person for dinner (we were here in November 2018). Equipment of the accommodation is also briliant (we had family room with two bedrooms and big bathroom). Cleaning every day. Outside are many swimming pools. There is also big inner Kids playground for free. 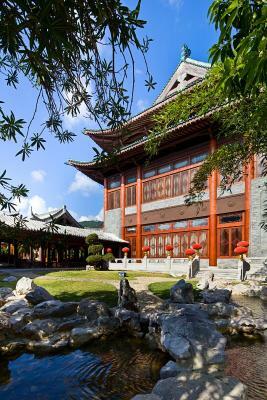 Featuring spacious swimming pools and their signature Huayu Spa, Huayu Resort offers indulgence and relaxation is steps from Baihua Gu. There is a 3500-square-yard indoor kid's club. Free WiFi is available in all areas. 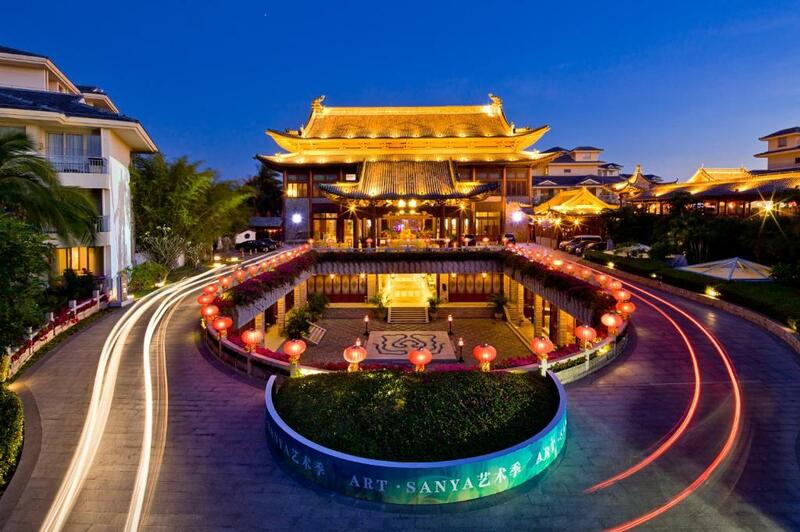 Located in the heart of Yalong Bay, Huayu Resort & Spa Yalong Bay Sanya is just a 5-minute walk to the beach. 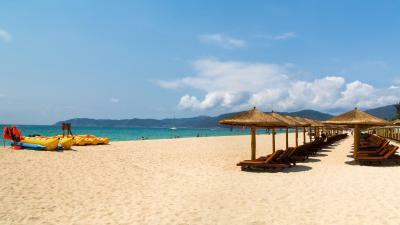 It is a 25-minute drive from Sanya Railway Station and a 40-minute drive from Sanya Phenix International Airport. La Floret International Shopping Village is just next to the hotel, offering various dining, entertainment and shopping options. 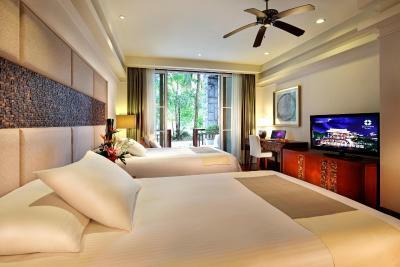 Modern rooms are equipped with an LCD TV, safe and private bathroom with bath and shower. A pillow menu offers a range from buckwheat to foam. Free wired internet access is provided. Leisure facilities include a well-equipped fitness room. 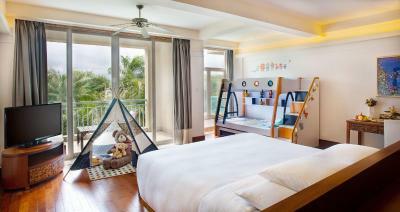 There are a spacious pirate-themed kids' club and an outdoor amusement park where children can enjoy a hilarious time. Huayu Spa features private treatment rooms and outdoor soaking tub pavilions with rain showers. 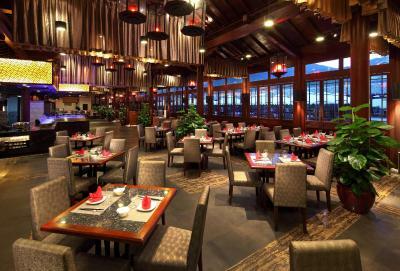 There are 7 restaurants and bars, with different styles of décor and cuisine to delight your taste buds. Located in the heart of the Baihua Valley, Baihua Yeyan Buffet Restaurant offers seafood and barbecue with fine brewed beer. Outdoor open-air stage makes a good spot for watching amazing acrobatics, magic and exotic band performances. 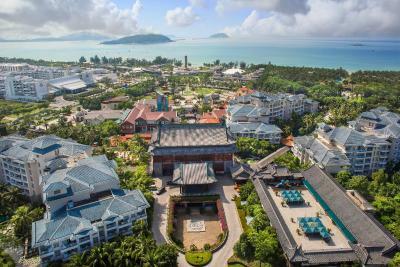 When would you like to stay at Huayu Resort & Spa Yalong Bay Sanya? Located on floors 2 to 7, these large suites feature a separate living room and are equipped with an LCD TV, mini-bar and an extra large bed. This suite features a balcony, DVD player and sauna. The suite features traditional Chinese decor and a round bed. This twin/double room features a balcony, bathrobe and soundproofing. 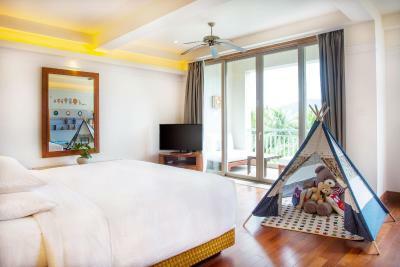 This twin/double room features a view, soundproofing and air conditioning. 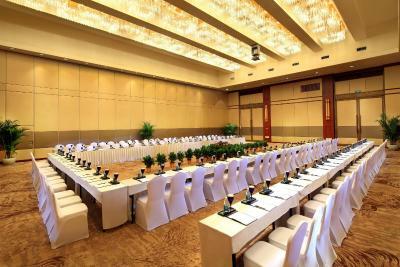 The hotel is located beside Bai Hu valley, where you can find western and local dinning options. you can try out the kid 's facilities with your children; invite your family and friends for a spa; enjoy the beach and blue ocean. 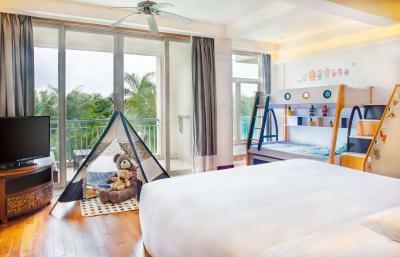 House Rules Huayu Resort & Spa Yalong Bay Sanya takes special requests – add in the next step! Huayu Resort &amp; Spa Yalong Bay Sanya accepts these cards and reserves the right to temporarily hold an amount prior to arrival. Huayu Resort & Spa Yalong Bay Sanya accepts these cards and reserves the right to temporarily hold an amount prior to arrival. 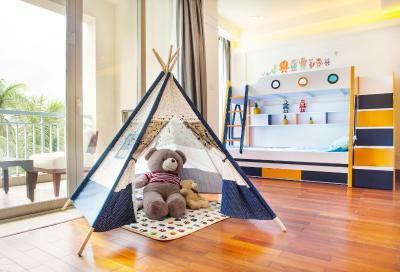 Please note that if your room rate includes breakfast, children under 3.9 feet staying with parents enjoy free breakfast. Children between 1.2 and 4.6 feet enjoy 50% discount on breakfast. Please note that "Complimentary use of mini-bar" will not be restocked for free during the stay. Nobody speaks English. There are pretty much only Chinese or Russian visitors and you could tell by all signs written in either Chinese or Russian. We really struggled to get any information in English and we had to use a translator all the time. But to be honest that's the issue in entire Sanya, not just this hotel. The lagoon pool isn't heated so sometimes it was bit too cold. Breakfast buffet, although it was nice, was really repetitive. So we ended up eating pretty much same things for 13 nights. The general staff were utterly unhelpful from start to finish. We arrived at midnight, straight off a flight, and were shown to our room which didn't have a double bed as we had requested. We went back to reception to inform them of the mistake and they said we hadn't requested one. I showed them the confirmation from booking.com that showed we had, and they told us to contact booking.com. We said we were the customer, it was midnight and it was their responsibility to sort this out, not us. We spoke to the manager and after an hour of back and forth, they finally took us to another room for the first night while they got the room we had requested ready. They blamed booking.com - fair enough, it might have been their fault and not the hotel's - but it certainly wasn't ours, and to ask a customer to sort this out at midnight is frankly ridiculous. It was very strange to see the attitude of the general staff. If the whole staff behaves this way, you can only assume they're treated horribly. Waiters would make eye contact and walk past the table to disappear behind a corner and play on their phones. The guy at the BBQ buffet was in a Wechat call while he served me, talking to his friend when I thought he was talking to me, and ignoring me when I tried to talk to him. I'm no stranger to Chinese customer service (I've lived in China for seven years) but this was surprising for a resort of this quality. The place isn't terrible, but it has gone downhill massively and there are much better resorts in the vicinity. I'd say avoid this place - it's the third time I've been here and it's the last. Steadily worse each time. The person there was so unfriendly, not even guide me how to go to my hotel, and when I was asked her, she just simply replied go straight and take the lift to L5. The facility for gym also poor. Breakfast was very crowded. Staff were stretched and rude. Crowd were mainland Chinese vis golfers at Mission Hills or overseas guests as per Shangri La. Beach is aprox. 400m away. You have to over the road and also over another hotel resort. If you dont want to cross another hotel the distance to the beach prolong to approx. 700m. 1. Were problem with toilet have very bad small. 2. Old water taps during use it drop water, so under floor aways have water. 3. Window was blocked can't use it. Hi All, The staff is nice and friendly but still needs to speak better English. The bathrooms were awful compared to the money which we are paying, As the showers were not working, with no hot water, It was terrible. But it could be the room which we got so cannot be generalized. 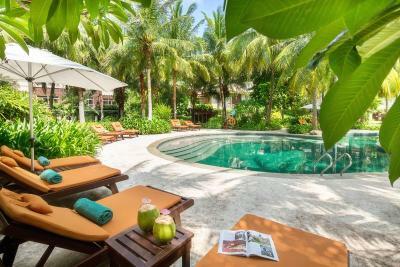 I like the breakfast, the location near the beach, the property, the swimming pools. Slow check as unable to locate my reservation. Room category was not matched. I was to stay in Deluxe Room, but they put me in Superior, which has some difference, and my room was not 68 sq m for sure. 2730 - is my room number. On the first floor there was a refurbishment. Several days there were problems with water, I couldn't get hot water when trying to take a shower. Staff works really good and seem to be helpful, but do not speak English. Every time it is a challenge to understand each other, and it is really hopeless. I used application on my phone with translation option. Toilet has fully transparent walls, so if you enter the bathroom no one else can go to toilet, and it is really strange and not convenient. 5 days of 10 days there was a strong wind. You can not stay at the lobby, as there are no walls and it is really cold. So I had to go somewhere else to just have some enjoyable free time. Lobby is nice, but not much place to sit and relax. What is good - the hotel itself is quite authentically build, and landscape is nice. Staff works really good, but do not speak English. Every time it is a challenge to understand each other, and it is really hopeless. I used application on my phone with translation option. Breakfast was good enough except for the sushi.